PDF Creator is a fast, affordable utility to allow you to create professional quality PDF documents. You can create PDF from PDF, XPS, plain text, image formats, including jpg, png, bmp, gif etc. Also you can set up the PDF password, modify the PDF meta information and merge multiple files into one single PDF file. Now support OS X 10.12 Sierra. ** Create more than just PDFs: Plain Text, PNG, JPG, TIFF, BMP, GIF, TIFF, etc. ** Security: Encrypt PDFs and protect them from being opened, printed etc. So no one can get access to your document without permission. ** Set PDF information:You can set meta data for the PDF, which can protect your copyright in your work, such as title, subject author and keywords. 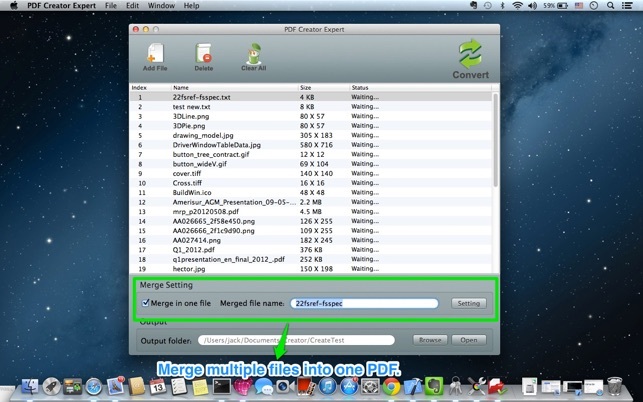 ** Merge multiple files into one PDF:You can merge a large amount of origin files into one PDF file. ** Support add encrypted PDF file. PDF Converter is a simple but powerful application which converts PDF files into Word, PowerPoint,Text and Images accurately and effortlessly. 1.Support convert XPS to PDF. 2.You can arbitrarily extract page number from one or more PDF/XPS files and merge into a new PDF file. 3.Manage and change page sequence as you wish. 4.Support add encrypted PDF file. Der Name suggeriert, dass man Files in PDF umwandeln kann. Dies tut die App nicht. Dass für Mac kein kostenloser PDF-Converter verfügbar ist, ist schon schlimm genug, aber dieser hier kann nicht mal Textdateien umwandeln. Very easy to use with great results! I was looking for an alternative for Acrobat and found this program. This one is a great one. I can only suggest it! Thanks for this affordable app.